If you look at the records of all the people buried in Belgrave Cemetery you may recognise some familiar names; there are former captains of industry, aldermen of the City of Leicester and even a few well-known local characters. But alongside a handful of 'names', there are more than 15,000 people for whom Belgrave Cemetery is their last resting place; people who, in life, worked in, or raised their families in, the Parish of Belgrave. Look again at the cemetery records; they provide us with only the barest of information; a name, age and the date and place of death. Is that all we know about our cemetery 'residents'? A walk round the cemetery, reading the headstone inscriptions will tell you a bit more - who was married to whom, and the names of close family relatives. But these were all living people, they can't just be names in a ledger or carved on a piece of stone. Surely we know more about them than that? Well, no we don't - or more accurately, we didn't. Now we know a great deal more about some of the cemetery residents. The Friends wanted to produce a small brochure for visitors to the cemetery, to bring some of the characters to life; What did they look like? Where did they live? What did they do for a living? A short request in the Leicester Mercury, “If you have relatives buried in Belgrave Cemetery and you would like to share their stories with us please get in touch”. Clearly we had far more information than we needed for a brochure, we had enough material to fill a book! And so, after two years of writing, telephoning, copying photographs and looking at census records on the internet, Sandra was finally able to present the Friends with the fruit of her labours - a book, entitled 'Living Memories - Belgrave Friends Remembered'. The publication was an immediate success; as one contributor says, “After my uncle died he lived on only in the memories of his family, now he is immortalised in print. Thank you”. So the friends have made a start; but there are still many thousands more stories to be gathered and preserved. But the story does not end there - how could we share our new-found stories with more of our cemetery visitors? We couldn't expect them all to buy a copy of our book, and any way, many people would rather listen to a story than read it in a book. 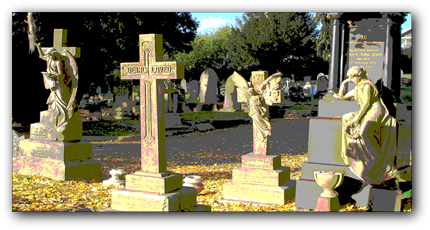 The Friends organise an occasional series of guided walks round the cemetery for visitors; why not include some of the stories we had collected in our guided walks? Using her love of theatre and acting, Sandra Moore offered to create a guided walk with a difference. Wearing a specially-designed costume and taking on the character of someone already at rest in the cemetery, Sandra would lead visitors to the plots of some of those included in our book and tell their stories. And not just tell the stories. To help her, Sandra chose Miss Elizabeth Goodwin, Head Teacher of Belgrave National School, who died in 1922; and visitors are encouraged to believe that they are being guided by a cemetery resident who is gossiping about her neighbours. Since that first walk-with-a-difference was created, two more have been added, and more are in the pipeline. 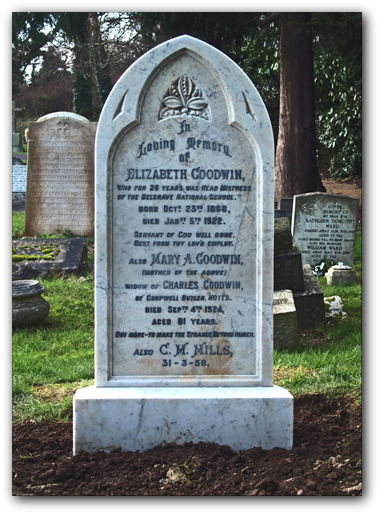 Because the character of Miss Elizabeth Goodwin has helped to recreate many of the cemetery residents in the minds of visitors, the Friends of Belgrave Cemetery looked for a way to say 'thank you'. 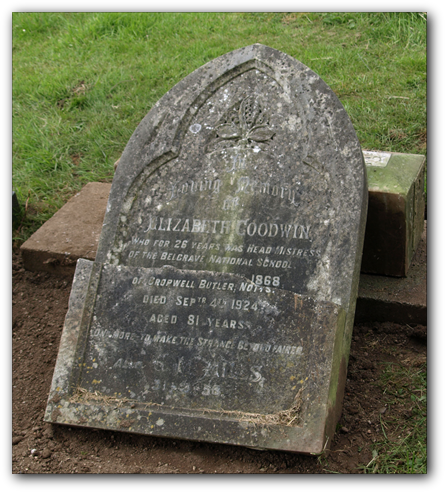 Miss Goodwin's headstone had fallen from its mounting plinth and the stone itself had been broken into two pieces many years ago. The surface of the stone was badly discoloured with lichen and mould, and much of the lead lettering was either missing or unreadable (see photo A). So the Friends decided that they would arrange to have the headstone cleaned, repaired and remounted in its original position. And if you look at the refurbished stone (see photo B) we think you will agree with us that the stonemason has done an excellent job. The line where the two halves of the stone were rejoined is almost invisible, the white marble gleams in the sunlight, and all the lettering is now legible. What a lovely way to say 'thank you'.